Recycled Potato Head Parts Bag! 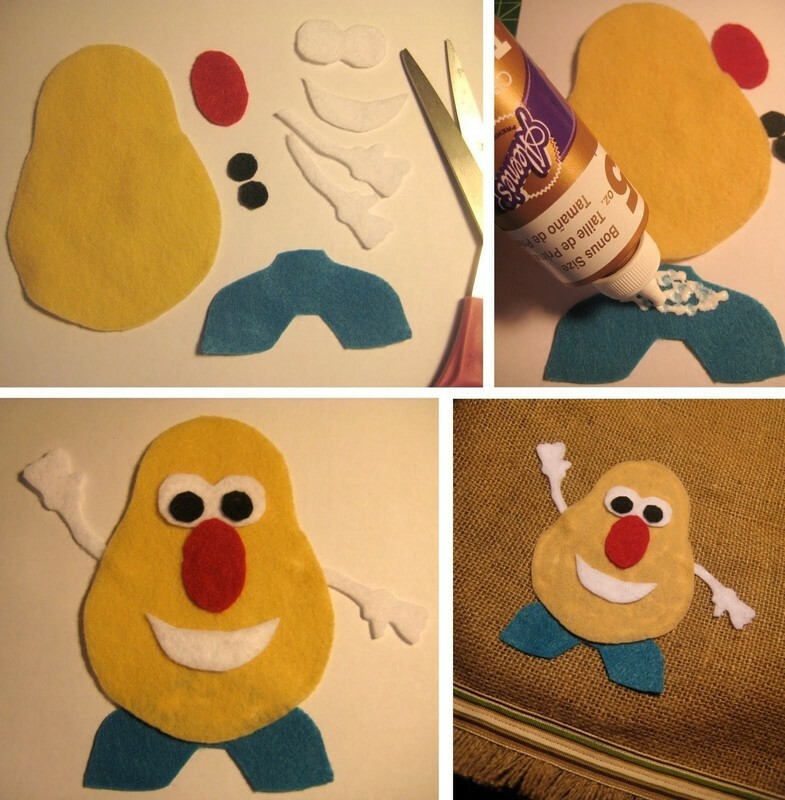 IDMommy Project: Recycled Potato Head Parts Bag! Sammy loves his Mr. Potato Head. They are best "spuds"...they even share each others' clothing and accessories. 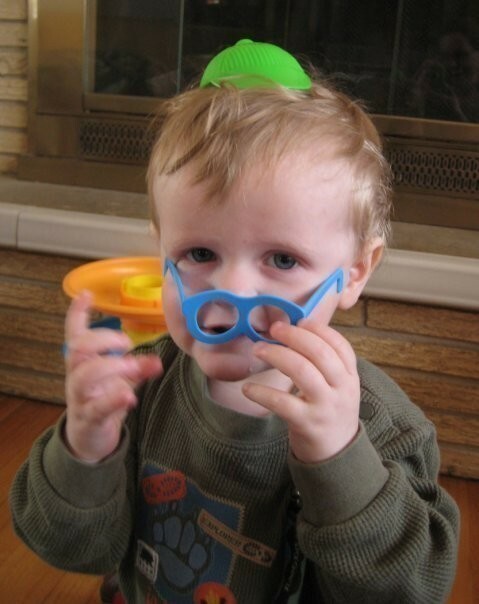 I've been frustrated for a long time with our current solution for storing Sammy's Mr. Potato Head parts. The plastic "Silly Suitcase" that they came in just is not up to par. The latch was too hard for him to open himself, so I had to put some tape on it to make it less strong. 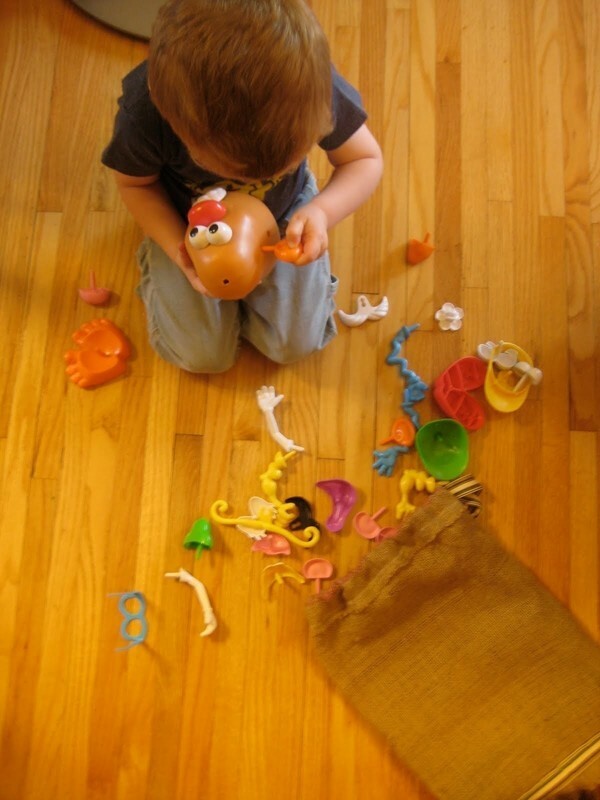 Now, of course, every time we pull it out of the toy box, the thing opens and dumps everywhere. 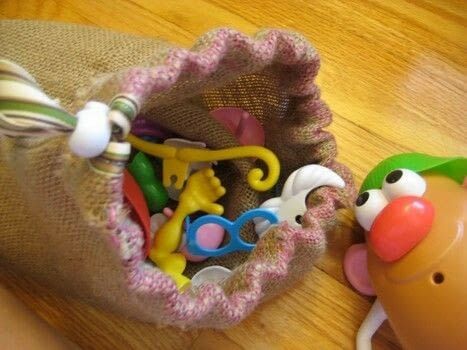 Plus, it's a bit of a puzzle to get everything to fit back in there along with the big potato himself. In all fairness, I did get it at a garage sale for $4 so I can't complain too much. But, the whole thing was taped shut when I bought it...a clue that the previous owner had the same problem! However, the industrial designer in me does not like to put up with poorly designed products and the hassle they cause me. So, I got to thinking, I could easily make a drawstring bag for Mr. 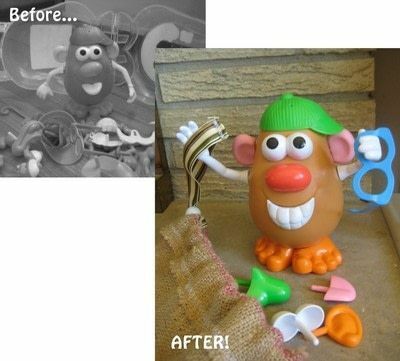 Potato Head and all of his "parts," like I've done for so many other things around the house. 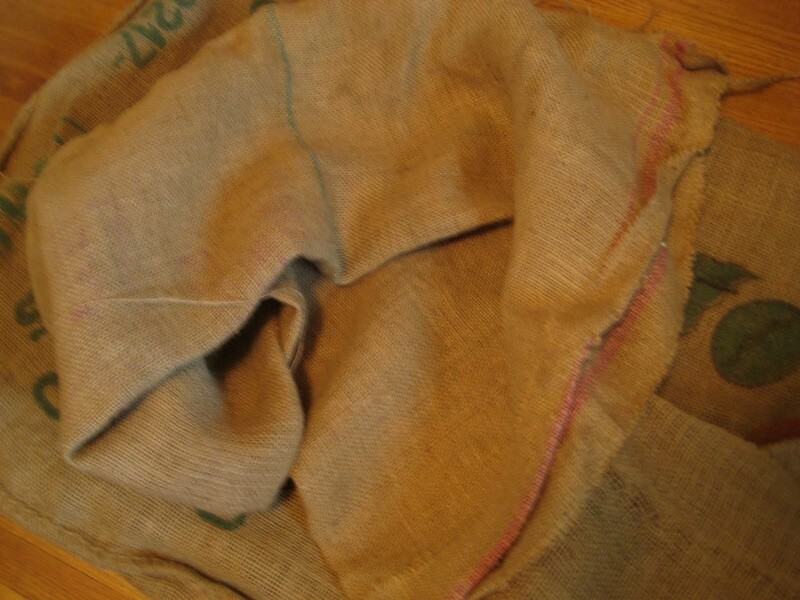 Then the idea came to me...what better material to use than an actual potato sack? 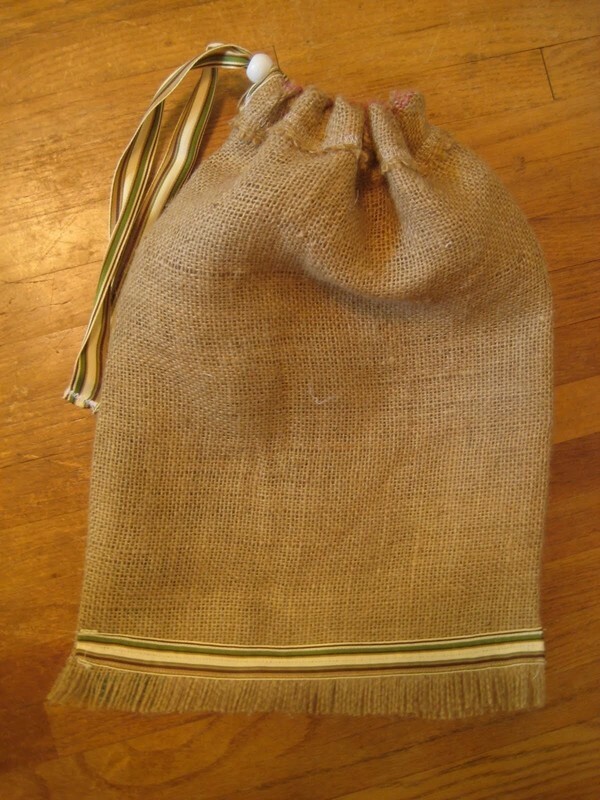 So, I posted a request for potato sacks on my local Freecycle site, and soon had a generous sole willing to give me two bags. (Thank you, "Harris" in Plymouth!) After a little cutting and sewing, Mr. Potato Head and all of his parts have a new stylin' pad! 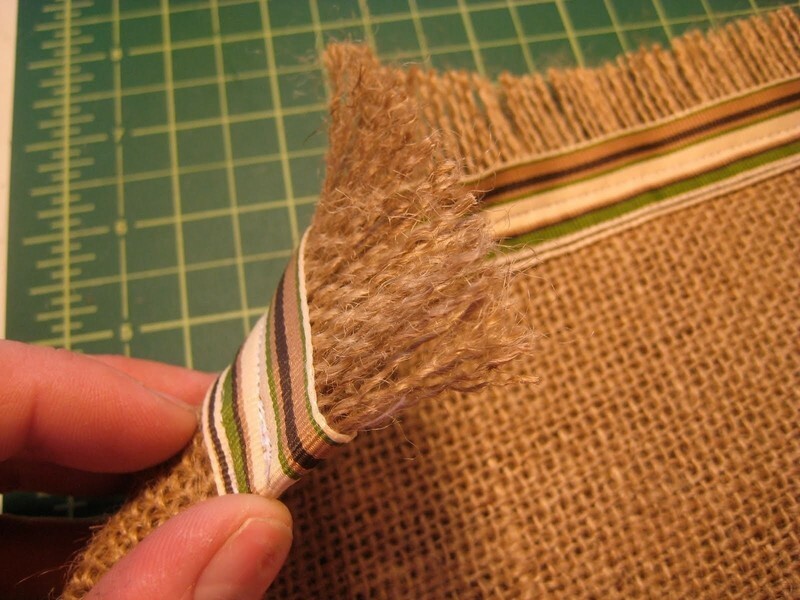 Obtain some burlap. The bags I got were pretty nice and clean...all I really had to do was give them a good shake outside. I did some web searching and found some people have had success washing burlap, while others warn against it. It's always a good idea to test wash a small piece to see how it reacts. Some people also suggesting using Febreeze to remove any odors in the bags if necessary. 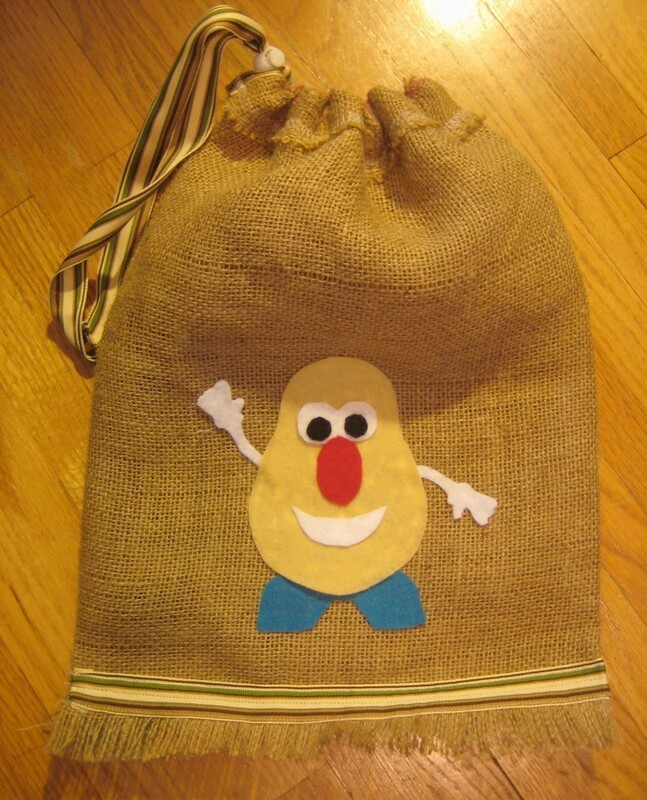 Cut out your pieces of burlap...I made mine 12" x 18", to allow plenty of room for wide seams, and space for Potato Head himself in the bag. 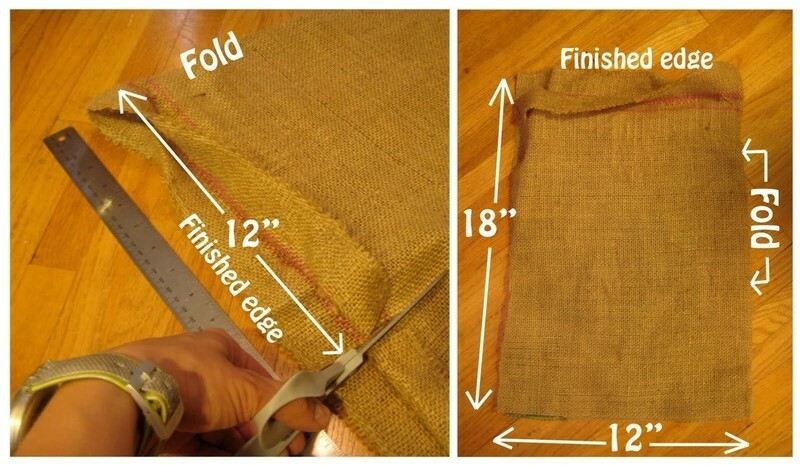 I cut from the fold in, to eliminate one seam and utilize the already finished top edge of the burlap, so it's actually one 24" x 18" piece folded in half. 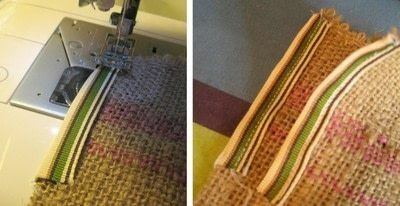 But, you can cut two 12" x 18" pieces as well. Cut a couple piece of ribbon, about 3" or so, and iron them in half lengthwise. 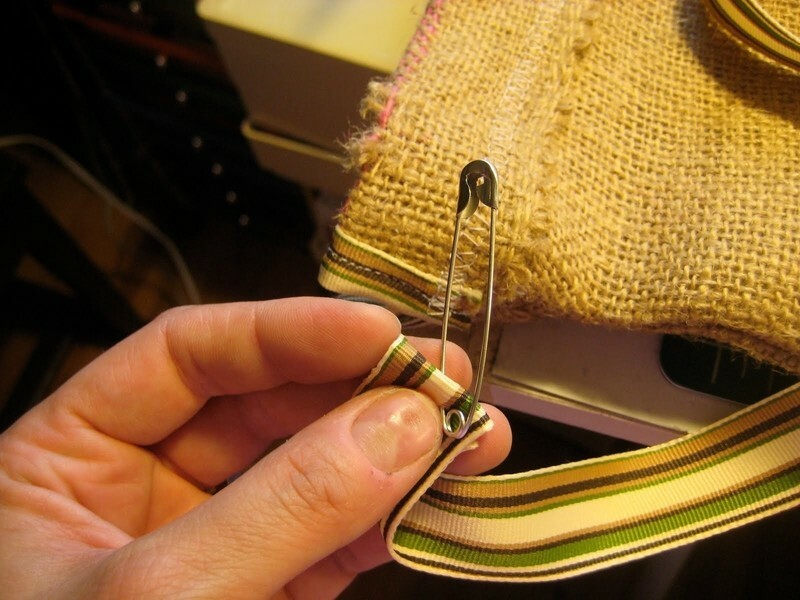 Sew the 3" pieces of ribbon on the top edges of the bag, flush with the finished edge. These will help provide "reinforcements" where the draw string will go through the top of the bag. Fold the top (finished) edge down 1.5", so the ends of the ribbon pieces match, for the drawstring pocket. 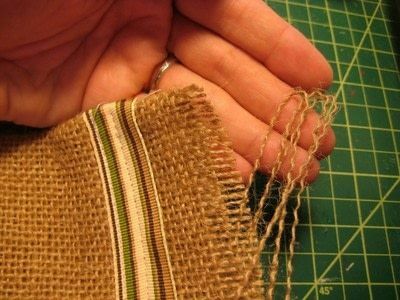 Sew along the finished edge, to create the drawstring pocket. I liked the look of the edge, so I am going to make that be on the outside of the bag. You'll want a pretty good stitch there for strength. 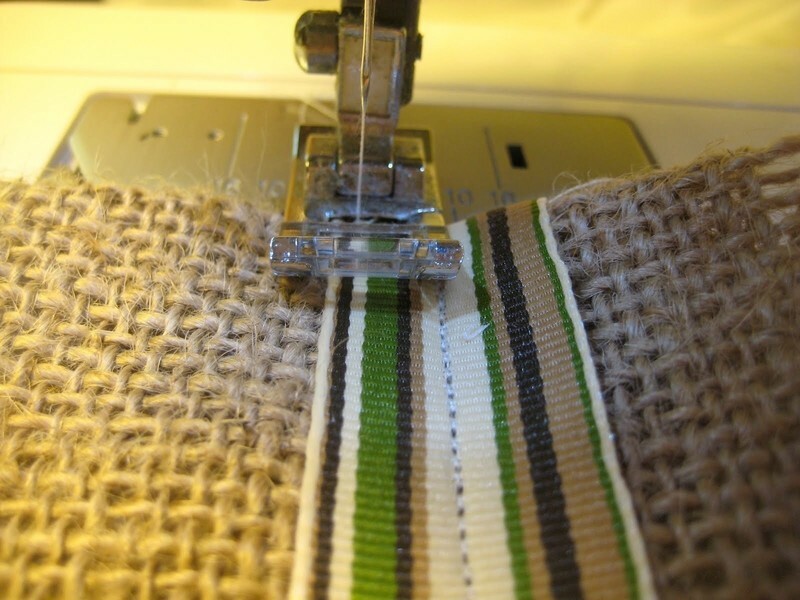 I used a stitch that looks like a zig-zag between two parallel straight stitches (see below, center). 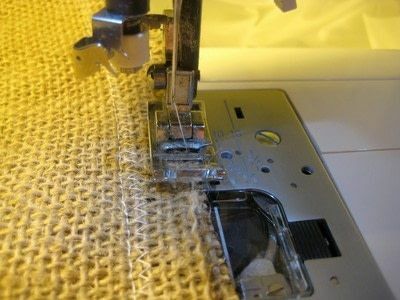 If your machine doesn't have these "fancy" stitches, just a couple straight stitches in a row will do just fine too. Start from the bottom of the ribbons (a), and sew at an angle in toward the bag for a 1/2"-1" or so (b). Then lift up the foot and turn the fabric parallel to the foot (c), and sew down the whole seam, stopping about an inch to inch and a half from the end (d). This will allow for your fringe along the bottom. 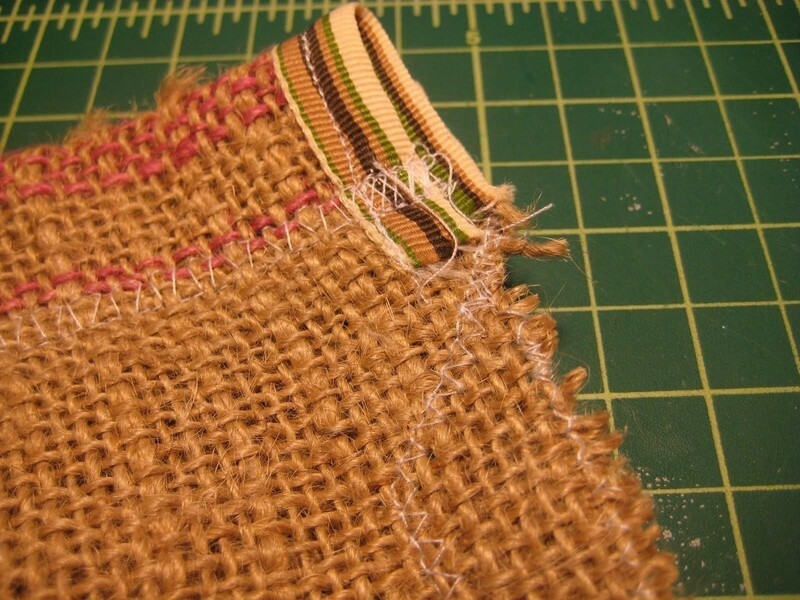 Next, I did a wide zig-zag along the edge to help keep it from fraying. 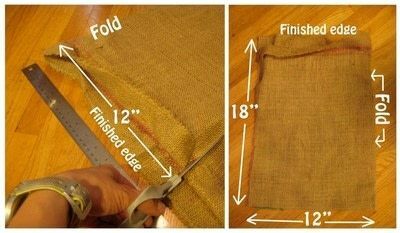 If you've used two pieces of burlap instead of a folded one like me, you'll need to sew the other side seam shut as well. Now your bag should be like a tube now with the top and bottom open. Turn it inside out. 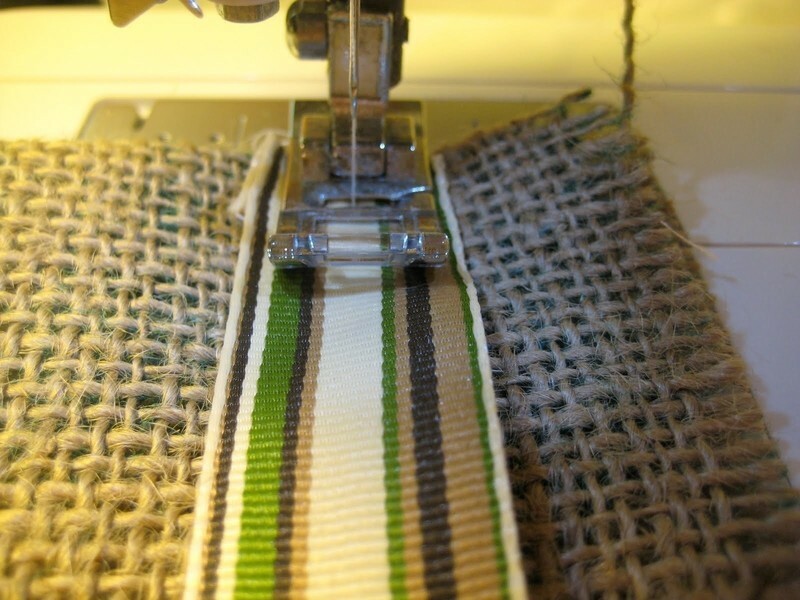 I am leaving the outside half of the ribbon (the side that faces the bottom of the bag) right now so that we can make the fringe go up under the ribbon before sewing that part secure. Now this part would be fun for your child to help with...pull all the loose pieces of burlap off of the bottom until you reach the ribbon, creating fringe! 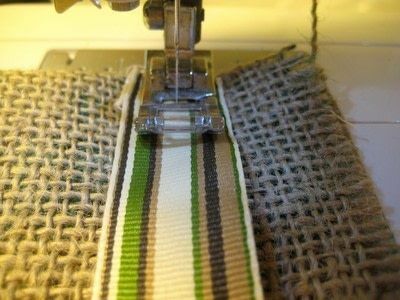 Cut a 34" piece of ribbon (or cord or string, etc.) for the drawstring. 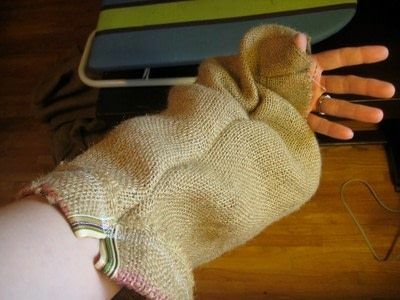 and fish it through the drawstring pocket. Finish off the drawstring. I got one of those spring loaded slider things off of a bag that some of my bed sheets came in (a). 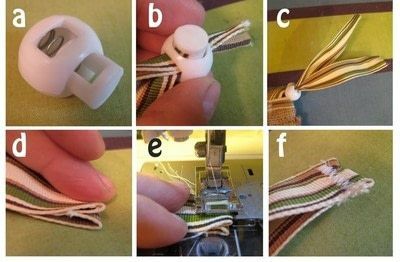 Press the button down and thread your ribbon or string through (b). Slide it down to the bag (c). To keep my ribbon from fraying, I folded each end about 1/4" and ironed it (d), then sewed a zig-zag stitch across the end (e), to get a closed end on my drawstring (f). The zig-zag end will help keep the slider from coming off when my kids open the bag. 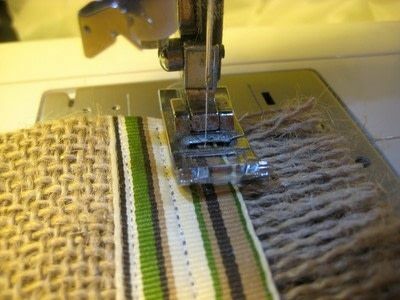 Now you have a fully functional bag with a funky fringe-y bottom! 1) Get some felt...I used scraps I had from previous projects. Cut out all of your shapes...I traced all of mine so you can download my pattern here! 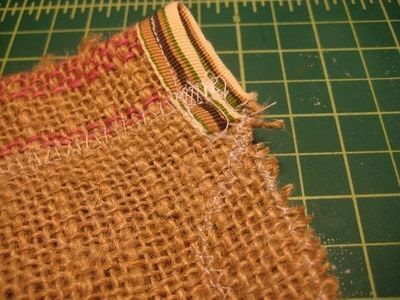 Glue the pieces together with fabric glue. I didn't make a hat or ears just because I didn't have any green or pink felt around, but those would be fun additions! 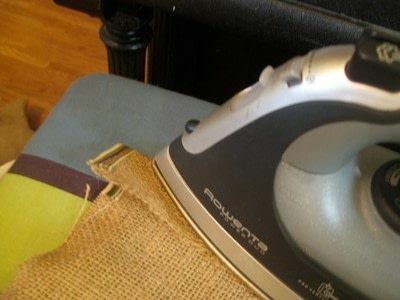 You can also use some iron-on adhesive like stitch witchery instead of glue. Glue the whole potato head man to the bag! TIPS: Slide a piece of wax paper inside the bag first to keep glue from seeping through and gluing the bag shut. Also, put glue on the back of the arms AFTER you've already glued down the body, as they are skinny and may want to flop around where you don't want them. This will help you place them right where you want them. 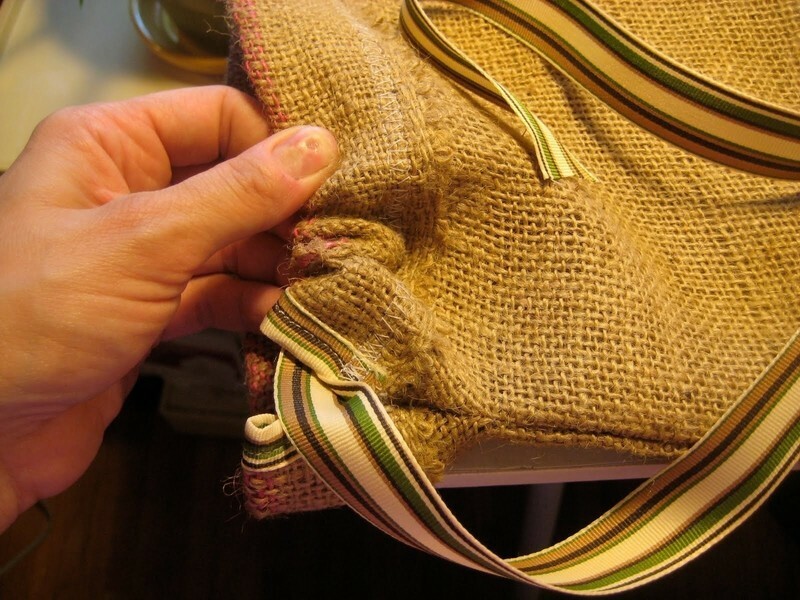 And finally, position him closer to the bottom of the bag, as the top will get wrinkled up when the drawstring is pulled tight. Thanks for sharing your how too! its great!